Every once in awhile, you meet someone who emanates humility and kindness. 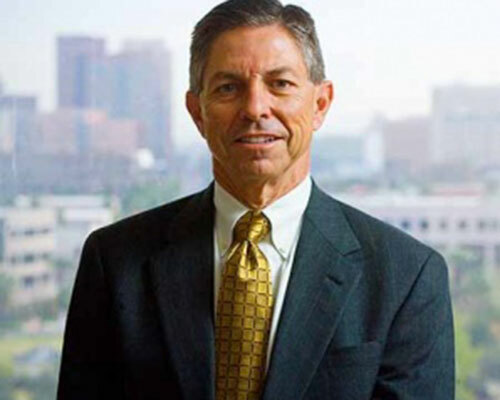 I’ve known Tom Manos, Maricopa County Manager, for many years and he has always been one of those people. Warm, giving and grounded, he is exactly the type of person you hope to see in a leadership position. And he is leading the charge in some really great initiatives for Maricopa County. A. I am an Arizona native. I grew up in Phoenix between 30th Avenue and Camelback, so I come from very humble beginnings. I’m the oldest of six siblings and we lived in an 1,100 square foot house with one bathroom. But we thought we were very middle class. I went to St. Gregory’s grade school and then Brophy for high school. I was very fortunate that my parents provided me and my siblings with a private education. I believe my education was one of the things that set me on the path to where I am today. So, this is interesting looking back. I actually started out as a Fine Arts major with very little talent. After about a year, I came to the conclusion that I could never support myself with that degree. I transferred to a finance and accounting degree because it was the safe thing to do. I have had this discussion with my own kids – you want to encourage your children to do something that they are passionate about and enjoy. But at the same time you have to find something that you can earn a living doing. I ended up graduating with a degree in finance. I became a CPA and have been accountant for most of my career. I read that you were in the Peace Corps in Liberia. What motivated you to serve in the Peace Corps and how has the experience shaped your view of the world? I think I have had a balanced life between my family, my professional career and doing community service. Before I came to the county, I co-managed a homeless campus down the street. But I think that community responsibility started with my Peace Corps assignment. Even today, I am looking forward to that next step whatever that might be. It probably won’t be going back to the homeless campus. But this week I made some inquiries about a short-term assignment in Liberia working at a home run by the Franciscans for kids who survived the Liberian civil war. I am also very active with a Catholic school in the White Mountains that a friend of mine started for Apache tribal members so maybe that will be the next step. If you asked me what two things changed my life, one of them would be my Jesuit experience at Brophy and the next would certainly be serving in the Peace Corps. What I learned was that serving the community is what makes me happy. When my son passed away, I had a really hard time finding what could make me happy again. I was reminded that I was the happiest when I served in the Peace Corps. I was the happiest when I had the least – when I had two pairs of Levis and two t-shirts to my name, and lived in a dump. At one point I had a boom box in Liberia. I was always worried that it would get stolen. Finally, it got stolen and it was such a relief that I didn’t have to worry about it anymore! So, my passion for community service really started with the Peace Corps. No, I just had lunch with Chairman Chucri and he went to Brophy. We were debating who was the worst student (laughter). I think I was the worst. I was a poor student, not a good kid. I speak a lot at Brophy that I was very lucky to get in and very lucky to graduate. So wait, how did you evolve into the leader you are today? Because clearly many people now view you as an inspirational and confident leader in the community. Maybe it was Peace Corps or just growing up. I will readily admit that I am not the smartest person, but I have very good judgment, no ego and I accept that I can only do the best that I can. So if something does not work out, then it doesn’t work out. At this stage in my life, I have been with the county for three years. The county has gone through tremendous change. I have replaced most of the management team with true all-stars. But it is not about creating a legacy for me. It is a recognition that I have a short time to do this and I am going to do the best I can. It is more the relationship skills that I have than being the smartest person in the room. I tell the truth and I have been lucky to be surrounded by smart people. For the first time, we are hiring people from other governments to join our team. A friend and leadership coach, Len Fuchs has stated: “Leaders listen then act.” Do you agree? What are some leadership lessons that you have learned along the way? This quote really resonates with me. When I first got here every one asked me what my vision was and what I hoped to accomplish at the county. I felt bad that I didn’t have an immediate answer. I went to all of the community groups and talked to everyone that I could, but I kept getting asked what my plan was for the county. I soon realized that the best answer to that question was that I was just going to listen for the first three months. After that, I promised I would tell them what my plan was. I had four new Boards of Supervisors, and went to all of the departments and listened. The conclusion I came to is that our vision is really only two things – provide outstanding customer service and creating a lean and efficient government. That’s it. Everything has to fall into these two buckets. Now, when I hire new people they ask me what I want them to do first, and I give them the same advice. I encourage them to spend the first month or two listening, and that they will figure out what the plan should be from there. So the quote you mention is right on. Everyone wants to be smart and commanding when they arrive in a new role, but you have plenty of time for execution. Listening should come first. Why did you choose a career in the public sector? I think it was a desire to find the right balance between making a living and doing something good for the community. I was very lucky. For the first seven years, I worked at the City of Phoenix for some great leaders – Frank Fairbanks and others. Working in the public sector has allowed me to make more than a reasonable living, but it allows me to do a variety of things. This morning, I had back-to-back meetings and then after lunch I met with someone else. All of these meetings centered on totally different subjects, but all have an impact on our community. So if you walk back to my office there are pictures of all of the county managers – and there aren’t that many – and I think, who else gets to do this? I didn’t plan to come back to work after leaving Governor Brewer’s administration, but the then-chairman of the Board of Supervisors asked me. I feel very fortunate to be in this position. Maricopa County is one of the few jurisdictions that weathered the economic downturn relatively well. The county has done an incredible job with its budgeting and pay-as-you-go financing. Tell me more about how the county is able to maintain such a secure financial position. The way I explain this is that if you look back to 1994, the county almost went bankrupt. The worst part was that the county didn’t know it was out of money until the county treasurer announced that there was not enough money for an upcoming payroll. We went out and negotiated a line of credit with a bank and then I’ll always remember that the cover story of Governing Magazine in 1994 was the best and the worst. The best was the City of Phoenix and the worst was Maricopa County. In 1994, the SEC sanctioned the county for inadequate disclosure in a bond offering. So all of these events happened. The result was that we laid off about one in ten employees in the county. If you talk to our grandparents who lived through the depression, you know that they wanted to make sure it didn’t happen again. That’s what happened here. So today the county has virtually no outstanding debt. And we have reserves set aside to pay off the debt that we do have. But I think after going through that painful experience, the County Board Members did not want to find themselves in that position again. The good news is that 10 or 12 years later Governing Magazine came back and gave Maricopa County the highest rating of all other counties in the country. So I think it is living through those hard times that created the very conservative budget policies that we have. The pay-as-you-go financing is very unique to Maricopa County. One example is the South Court Tower that we built. It has been open for three years next February, and was paid for in cash for $350 million. The thing is, though, I don’t think we will ever be in the position to do that again. So, right now part of our strategic planning the board is trying to figure out how it will pay for big capital assets again. We will build a new jail on the west side for $185 million to be paid in cash. But that is the last big project. What do you see as the biggest opportunities for Maricopa County? And, the biggest challenges? The biggest opportunity and the biggest challenge come together, and that is that public safety and the courts have become a bigger and bigger portion of our budget over time. And, they are growing at high rates, which are not sustainable. We have reduced budgets in other departments to fund public safety and criminal justice. The biggest opportunity is to have a new discussion about who we house in our jails. In the courts, the biggest opportunity is the use of technology. I met with the new presiding judge of the Maricopa County Superior Court system and she told me that judges have to be technology savvy. If you look at how many cases we process through the Maricopa County Superior Court, it is technology that makes it possible. “The road to heaven is heaven.” Do you know what that means? It goes back to my Peace Corps days. It means doing those things that we are taught that will lead you to heaven, actually creates heaven on earth. The converse is the “road to hell is hell” (laughter). But really, it all goes back to community service – that’s what makes you happy. Cycling. It makes me feel young! The one piece of advice that I always give is that public service is honorable work. It is fulfilling and you can make a reasonable living. But what I tell kids now is at odds of what I did myself. I tell them to be thinking about applying for a new job every two years to expose themselves to all of the different services government provides. I hear people say that they are reluctant to hire a candidate because it will just be a stopping point. But I tell them – if you get two great years out of the candidate, that is great! I am so fortunate that early on I became friends with Betsy Bayless. She pulled me aside one day and told me to do something different. And she told me about an open position for the parks administrator knowing that I love to bike, hike and run. And so I did. What a wonderful job! When I went to work for Governor Brewer, it was risky and at times painful, but I am a better person for doing it. Explore other things.